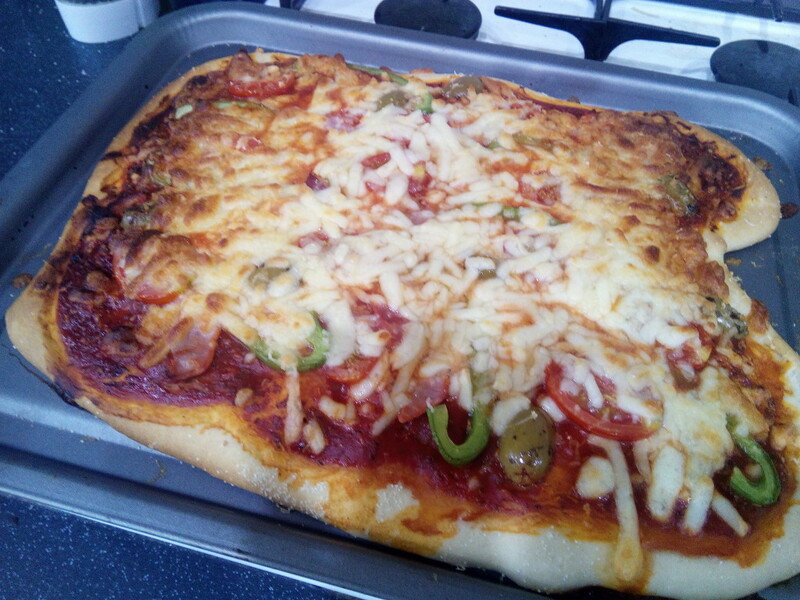 I’ve made pizza only once before. It wasn’t a huge success but it wasn’t terrible either. I’d say this was a marginal improvement (but sadly it was still too soggy for Mr Birdie’s liking). 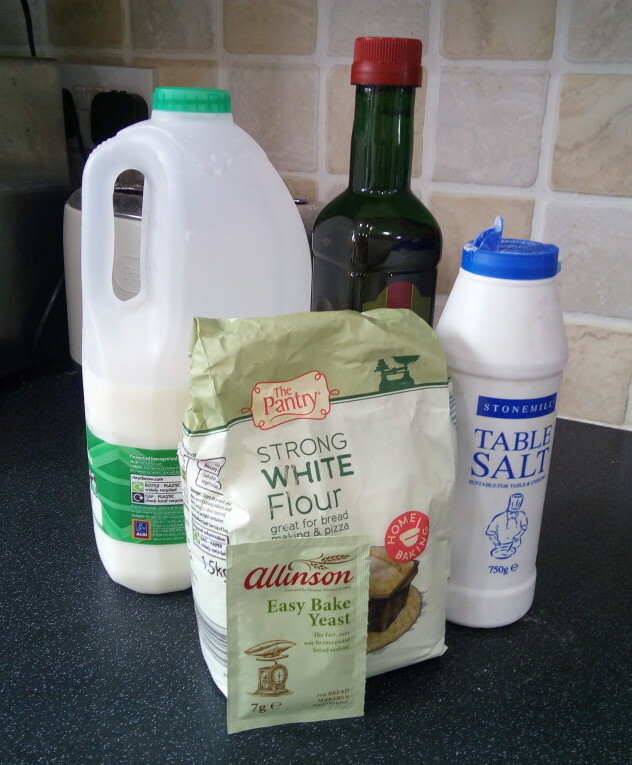 I was inspired after watching this week’s Great British Bake Off and felt I should make something requiring dough! Personally I thought this week’s episode was amazing. The contestant’s showstoppers were simply outstanding. I seemed to spend the whole episode going ‘Wow!’, ‘That’s amazing’ and ‘Oh my gosh!’ For my pizza dough I used Holly Bell’s (of GBBO fame) recipe which you can find online here. 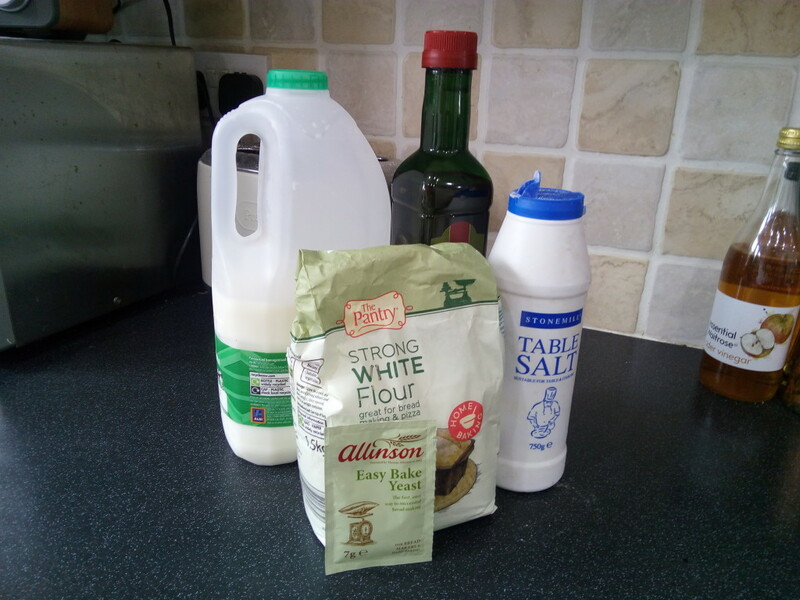 I also used this BBC Good Food recipe for cooking and topping advice. 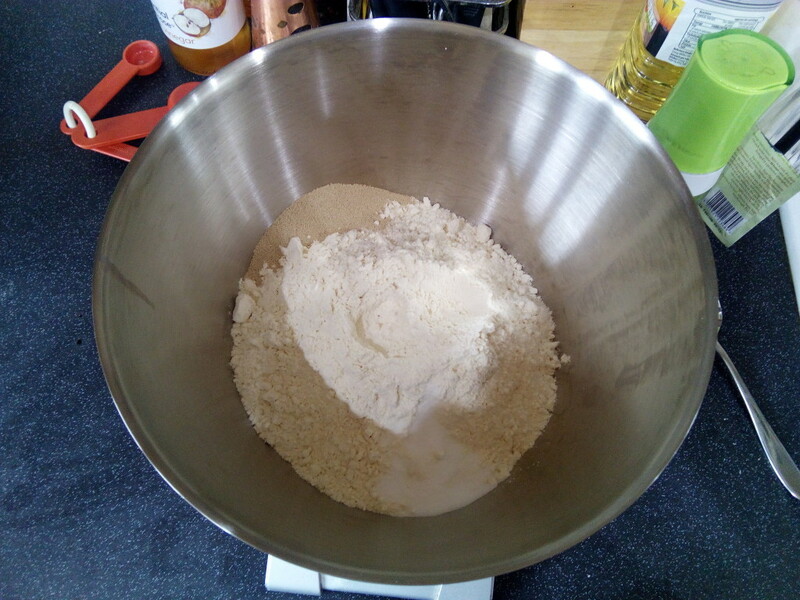 I followed Holly’s advice and made the dough in my food processor – something which I’ve not done before. The dough will take one and a half to two hours to rise so make sure you give yourself enough time. Choose whatever toppings you want (or in my case whatever you have lurking in the fridge). I went for grated mozzarella (left over from these cheese and pesto whirls), ham, peppers, olives and baby plum tomatoes. This recipe will make enough dough for 6 large (individual) pizzas. I split mine into three and put the two leftover bits in the freezer. Our pizza was definitely big enough to share between myself and Mr Birdie. 3) Once the dough has risen put the bowl back into the mixer and knead using the dough hook on a low speed for about 2 minutes until your dough looks and smooth again. (If kneading by hand this takes about 4 minutes.) Now it’s ready. 4) Divide your dough into as many pizzas that you want. 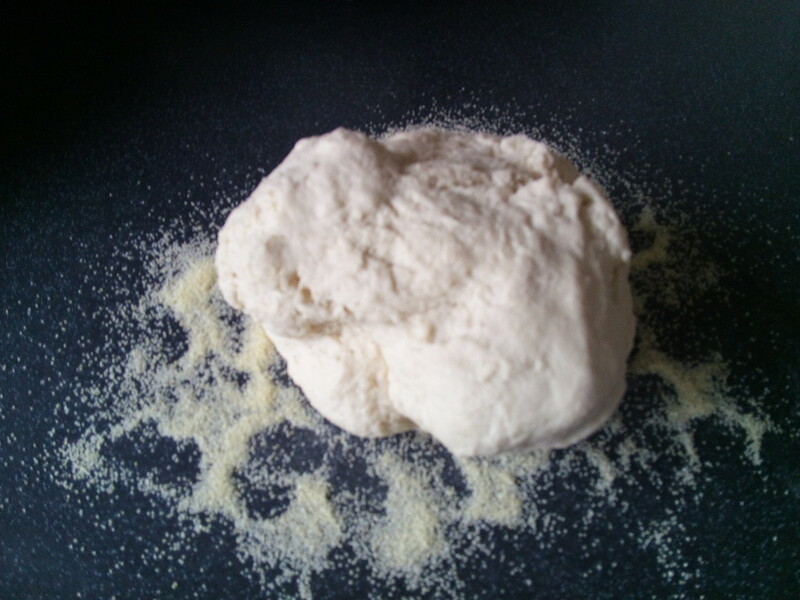 Take some semolina (or flour) and put a handful on your work surface, then take your pizza dough and cover the whole thing in semolina – all sides. Then start rolling. The thinner you get your base the crispier your pizza will be. You want to get it as thin as possible without breaking. You can go for any shape you want! 5) Put your dough onto a baking sheet making sure the edges don’t escape over the edge (otherwise you will end up with burnt crusts). A helpful hint if you’ve made an especially large pizza is to fold the dough into half and then quarters to transfer it to the baking sheet. 6) Heat your oven to 240C/220C fan/Gas 8. Put another baking sheet or an upturned baking tray in the oven on the top shelf. 7) Add your toppings. For the tomato sauce I used about 200ml of passata with some dried herbs (mixed and oregano) and a crushed clove of garlic added. Smooth your sauce over the base with the back of a spoon and then scatter on your toppings. Drizzle with olive oil and season. Put your pizza, still on its baking sheet, on top of the preheated sheet or tray. Bake for 8-10 minutes until crisp (I found mine top a bit longer).